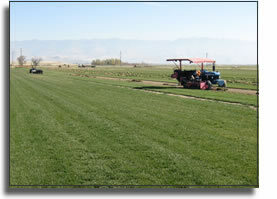 A professional sod lawn needs no special care because it is a healthy mature lawn when installed. It is weed free and doesn't require months of nurturing like a seeded lawn. Just water, mow and fertilize your sod lawn as needed and you'll have a healthy, green yard requiring very little maintenance. Sod establishes itself quickly. It is ready for full usage in just a few weeks. Sod is often used to stop soil erosion and water pollution on slopes where rain would wash away both seed and soil. Sod cools and cleans the atmosphere by reflecting heat and absorbing noises, carbon dioxide and other pollutants. Sod is a great investment. Sod takes you from bare soil that tracks dirt into your home, to lush green lawn in just hours. In the few hours it takes to install your sod lawn, your property value increases as well as your aesthetic value. Need assistance... or have a question? We're happy to assist you. Please complete the form below and we will contact you with an answer.